A new study has shown that neurotoxic pesticides blamed for the huge drop in bee numbers are also equally affecting butterflies, worms, fish and birds. Poor fellows! 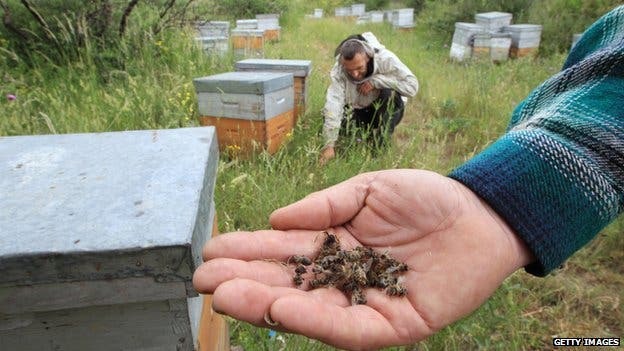 The decline of bees around the world is increasingly linked with neonicotinoid chemicals. Analyzing two decades of research on the topic, they found out that two classes of pesticides – neonicotinoids and fipronil – show “clear evidence of harm”. “We are witnessing a threat to the productivity of our natural and farmed environment,” said Jean-Marc Bonmatin of France’s National Centre for Scientific Research, co-author of the report entitled the Worldwide Integrated Assessment. In case you’re not aware, bee populations are dwindling. All around the world, bee populations are dropping more and more, and until recently, scientists still wasn’t sure why this was happening. Now, even though there isn’t a general consensus, there are very strong indications that it’s pesticides that trigger this drastic reduction in bee numbers. To make things even clearer, in countries which have banned these pesticides, bee numbers are starting to rise again. But as huge as the bee damage is, other creatures are threatened just as much by the insecticides. As they seep into the underground or waters, neonics affect freshwater snails and water fleas, then birds, and finally fish, amphibians and certain microbes. They have also been linked with autism. However, the most damage is done to terrestrial invertebrates such as earthworms. We don’t really think about earthworms, because, well, they’re not pretty, and most people don’t see them as useful – but that’s a shallow point of view. Earthworms are crucial in ecosystems, as they provide crucial soil-enrichment and aeration. With dropping worm populations, the local plants will be under even more stress, and the results will be devastating. “The combination of their widescale use and inherent properties, has resulted in widespread contamination of agricultural soils, freshwater resources, wetlands, non-target vegetation, estuarine and coastal marine systems,” the authors wrote.